In this and similar reports we will be examining the global "earthquake weather", and reporting where our research shows that there maybe siesmic vulnerability and activity. Although we can do this for each and every one country now, due to time contraints, the nature of the research, (we will betesting variant ideas), we will be listing out a few across the world. We hope this is useful to you, and certainly it will help us improve our techniques. Using our methods we can deduce that for 10th February 2017, the following quakeweather and the following regions appear to be vulnerable to siesmic activity. Our experience shows that the time event tolerance can be +-1 day, and therefore it is worth keeping the list for 2 days as an event in the list could sometimes materialise the next day. Februry 10th again is not a day where we expect the worst earthquakes. Certainly it seems that it will be less or similarly active than 9th February. (improvement or steady "quake-weather") even if it is for a day. 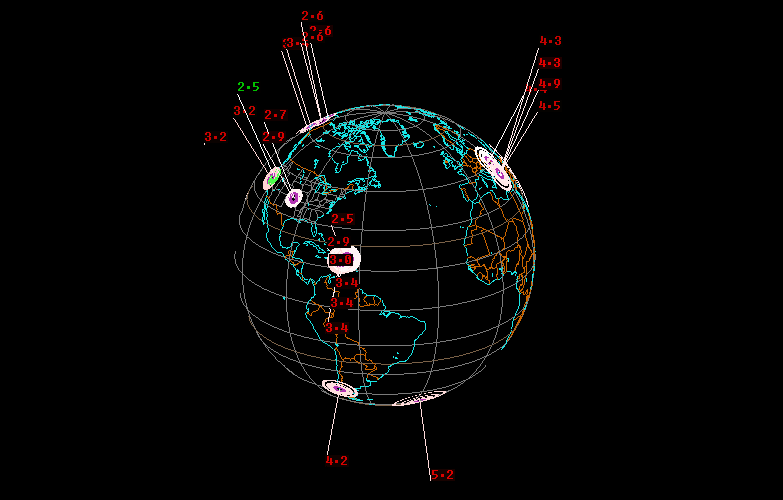 What we should expect however is Doubles and Triples again like yesterday, (that is multiple earthquakes of the same magnitude in the same location, time separated during the day), as the conditions for such events are right. The following are some coordinates we produced using our methods. AMERICAS: Nothing more unusual but I wont be surprised to see events in Calofornia, Mexico and Chile. ASIA/AUSIE: I expect to see Taiwan affected if it does not come on 9th February. The rest of the countries which could come up are shown below. Tonga (22S, 174.7E) if not on 9th February. Taiwan (25.3N, 121.6E) if not on 9th Feb which I expect. Solomon Islands (7S, 156.8E) if not on 9th Feb which I expect. Beaching of the Whales in NZ? Anybody see the correlation here? Any additional prediction? I did not know of this happening in NZ, I guess it happened today? Yes over the next few days we have some signal. See http://www.earthquakepredict.com/2017/01/new-zealand-earthquake-predictions-for_30.html. Tell us where and we keep an eye.